The book concludes by dividing the countries studied into three groups: the willing, the cautious, and the ambivalent, according to their willingness to participate in the operations studied. The chapter asserts that the normative frameworks of the strategic cultures explain decisions to participate or not in international military operations, and how such decisions are justified. The regulatory frameworks decide how quickly such decisions can be taken, which in turn might affect willingness to participate if the domestic process is outpaced by a rapid international process. The findings of the book are also used to analyse the first six months of air raids in Iraq after the Iraqi government asked the USA and its allies for help to fight the Islamic State/Daesh in the summer of 2014. The author is deeply indebted to research assistants David Rangdahl and Thomas Olsson for help with information in comparing how the different countries have participated in the operations studied in the chapters of the book, and for compiling information on our ‘reference case’—the beginning of air strikes in Iraq in 2014. Some sections in this chapter rely on their hard work. Bundeswehr. 2014. Transporte abgeschlossen, Material ubergeben—Einweisungen gehen weiter. 4 Nov 2014. http://www.einsatz.bundeswehr.de/portal/a/einsatzbw/!ut/p/c4/LYtBC4JAEIX_0Y5LxVI3xUt0skvZRVYdZEhnZZxNkH58K_QefPD4ePCCVPYfGrxSYD_CE-qOLu1q2rXHBokXr1uakRVl0Yi6RR4aEv-Gx_7u0XSBUXcqslLiIF6DmDmIjruJIskY6qHObFlYd8z-sd9zdcvdybpDeS3uME9T_gN5x1qS/. ———. 2015. Der Bundeswehr Einsatz Am Horn von Afrika. Aktuelle Einsätze. http://www.einsatz.bundeswehr.de/portal/a/einsatzbw/!ut/p/c4/04_SB8K8xLLM9MSSzPy8xBz9CP3I5EyrpHK9pPKU1PjUzLzixJIqIDcxu6Q0NScHKpRaUpWqV5yfm5iTmaiXmZeWHw_l6BdkOyoCAKLz-AE!/. Accessed 17 July 2015. ——— 2014b. France will send weapons to Kurds in Iraq, 12 Aug 2014. http://www.ambafrance-uk.org/France-will-send-weapons-to-Kurds. European Union External Action. 2012. French Navy Falcon 50M Relieved by Maritime Patrol Aircraft Atlantique 2. EU-NAVFOR Somalia. http://eunavfor.eu/french-navy-falcon-50m-relieved-by-maritime-patrol-aircraft-atlantique-2/. Accessed 17 July 2015. ———. 2014. Italian Air Force Completes Its First Remote Controlled Aircraft Sortie for Operation Atalanta. EU-NAVFOR Somalia. http://www.eeas.europa.eu/csdp/missions-and-operations/eu-navfor-somalia/news/20140911_1_en.htm. Accessed 17 July 2015. European Union External Action. n.d.. Operation Description. EU-NAVFOR Somalia. 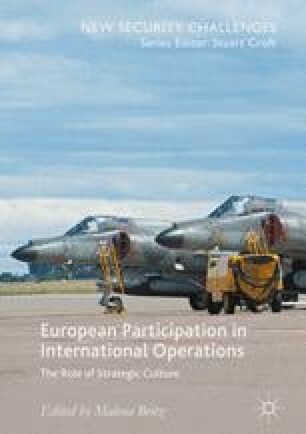 http://eeas.europa.eu/csdp/missions-and-operations/eu-navfor-somalia/mission-description/index_en.htm. Accessed 17 July 2015. Gebauer, Matthias. 2011 The War in Libya: Are German Soldiers Secretly Helping Fight Gadhafi? Spiegel Online. http://www.spiegel.de/international/world/the-war-in-libya-are-german-soldiers-secretly-helping-fight-gadhafi-a-781197.html. Accessed 17 July 2015. Government of the UK. 2014a. David Cameron Statement on Iraq. Press release, Prime Minister’s Office. 8 Aug 2014. https://www.gov.uk/government/news/pm-statement-on-iraq. ——— 2014b. Emergency UK aid for displaced people in Iraq. Press release, Department for International Development. August 8. https://www.gov.uk/government/news/emergency-uk-aid-for-displaced-people-in-iraq. ——— 2014c. Threat level from international terrorism raised: PM press statement. Speech, Prime Minister’s Office. 29 Aug 2014. https://www.gov.uk/government/speeches/threat-level-from-international-terrorism-raised-pm-press-conference. ——— 2014k. Surveillance missions over Syria. News story, Ministry of Defence. 21 Oct 2014. https://www.gov.uk/government/news/surveillance-missions-over-syria-confirmed. Hentsch, Franziska. 2014. German military gear delivered to Iraqi Kurds. Deutsche Welle. 5 Sep 2014. http://www.dw.de/german-military-gear-delivered-to-iraqi-kurds/a-17903253. House of Commons Debates. 2014. Iraq: Coalition Against ISIL. 26 Sep 2014. http://www.publications.parliament.uk/pa/cm201415/cmhansrd/cm140926/debindx/140926-x.htm. International Security Assistance Force. 2007. ISAF Facts and Figures: Placemat 02 January 2007. http://www.nato.int/isaf/placemats_archive/2007-01-29-ISAF-Placemat.pdf. ———. 2009a. ISAF Facts and Figures: Placemat 22 December 2009. http://www.europarl.europa.eu/meetdocs/2009_2014/documents/sede/dv/sede250110natoisaffigures_/SEDE250110NATOISAFFigures_EN.pdf. ———. 2009b. ISAF Regional Command Structure. ISAF Topics. http://www.nato.int/isaf/structure/regional_command/index.html. Accessed 17 July 2015. ———. 2010. ISAF Facts and Figures: Placemat 14 December 2010. http://www.rs.nato.int/images/stories/File/Placemats/14DEC%202010%20Placemat.pdf. ———. 2011a. ISAF Facts and Figures: Placemat 04 March 2011. http://www.nato.int/isaf/placemats_archive/2011-03-04-ISAF-Placemat.pdf. ———. 2011b. Nota Aggiuntiva Allo Stato Di Previsione per La Difesa per L’anno 2011. http://www.difesa.it/Approfondimenti/Nota-aggiuntiva/Documents/NA2011edMarzo.pdf. Accessed 17 July 2015. ———. 2013. ISAF Facts and Figures: Placemat 01 August 2013. http://www.nato.int/isaf/placemats_archive/2013-08-01-ISAF-Placemat.pdf. Ministero della Difesa. 2005. Nota Aggiuntiva Allo Stato Di Previsione per La Difesa per L’anno 2005. http://www.difesa.it/Content/Documents/nota_aggiuntiva/86808_NotaAggiuntiva2005.pdf. Accessed 17 July 2015. Perito, Robert M. 2005. US Experience with Provincial Reconstruction Teams in Afghanistan: Lessons Identified. http://www.usip.org/sites/default/files/sr152.pdf. Accessed 17 July 2015. Resolute-Support NATO. 2015. Afghan National Army Troops Receive Vital Training. RS News. http://www.rs.nato.int/article/news/afghan-national-army-troops-receive-vital-training.html. Accessed 17 July 2015. See also: http://www.dw.de/german-weapons-deliveries-to-iraqs-kurdish-region/a-17892161. The White House. Statement by the President. Office of the Press Secretary. 7 Aug 2014a. http://www.whitehouse.gov/the-press-office/2014/08/07/statement-president. United Nations Security Council. 2001. Resolution 1386. http://daccess-ods.un.org/access.nsf/Get?Open&DS=S/RES/1386%20(2001)&Lang=E&Area=UNDOC. ———. 2011. Resolution 1973. http://www.un.org/en/ga/search/view_doc.asp?symbol=S/RES/1973. United States Department of Defence. 2002. International Contributions to the War Against Terrorism: Fact Sheet. http://www.defense.gov/news/May2002/d20020523cu.pdf. UNSCR 2170. 201415 Aug. http://www.un.org/press/en/2014/sc11520.doc.htm. USAID. 2015. Provincial Reconstruction Teams. USAID. http://www.usaid.gov/provincial-reconstruction-teams. Accessed 17 July 2015.